The city hall has an odd attachment, the Powder Tower or Prasna Brana, restored in 1883. For the preceding 400 years of its existence, it had been nearly ignored, because the king of Bohemia had moved across the river to Prague Castle and suspended work on the tower, begun in 1475. A temporary roof was installed, and the place became a storehouse. 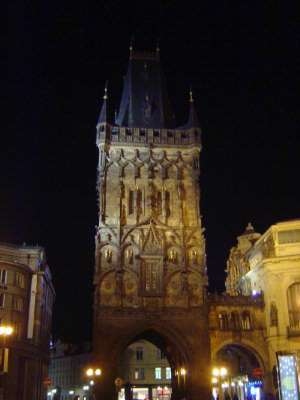 Four centuries later the tower became (and remains) an icon of the city. The street beyond leads straight to the city square.